This is the second of two posts on Portsoken Ward. The earlier one having dealt with its Saxon history, we come now to the Medieval and Modern eras. 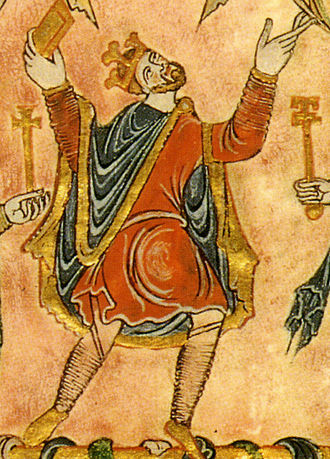 The somewhat mysterious "Knighten Guilde," established under King Edgar the Peaceable, did not long survive the Norman Conquest. 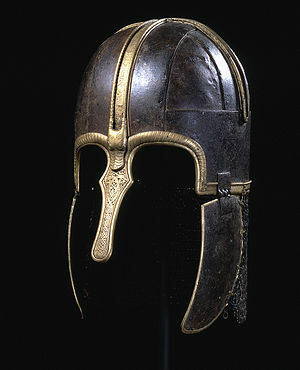 There were only thirteen "knights," some of whom probably died at Stamford Bridge, and others at Hastings. Those who remained, and their heirs and successors, almost certainly lost their right to bear arms. 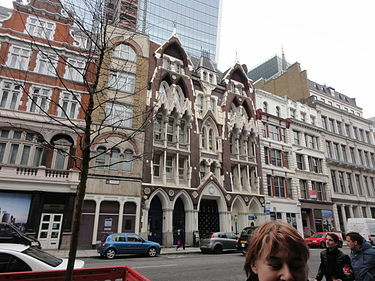 The Guild continued in name only and, in 1115, its members gifted their land to the Augustinian Priory of Holy Trinity Within Aldgate. 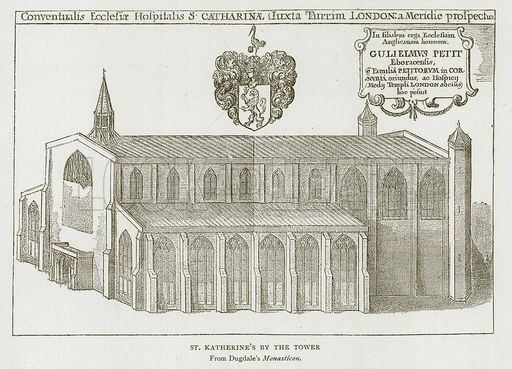 In 1147, Queen Matilda, the consort of King Stephen, established a hospital dedicated to Saint Katharine at the southern end of Portsoken Ward, to the east of the Tower of London. That she did this with the support and assistance of the Augustinian Prior, who had a close relationship with the Royal Family, is almost certain. 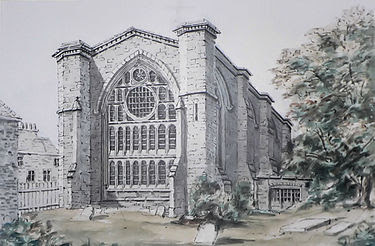 The east end of the hospital church (image is in the Public Domain). The hospital, London's second (after Barts), had a master, three brothers, three sisters, and a bedeswoman (an almswoman whose role was to pray for the benefactors). Whilst its medical facilities are likely to have been limited (one can, perhaps, imagine novices running between the city's various monastic houses in search of herbs), it played an important role, over almost eight centuries, in providing what we might today call "palliative care," for people severely disabled, or otherwise unable to care for themselves. 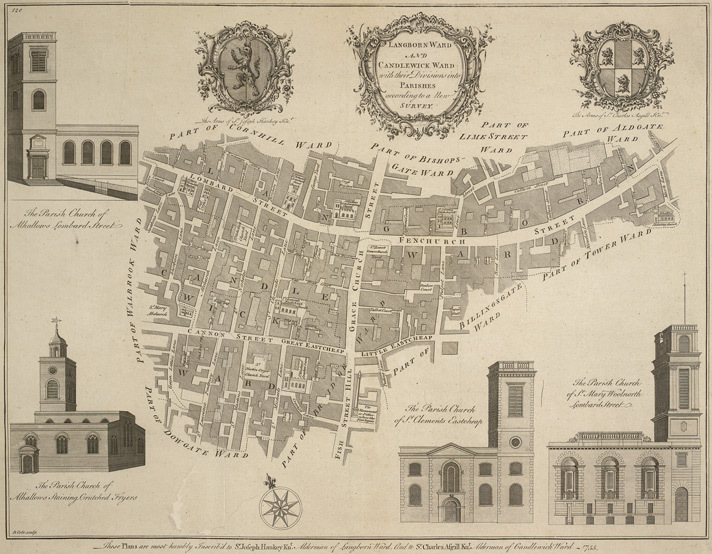 By 1442, it had twenty-three acres of land, with its own prison, officers and court, all operating outside the ecclesiastical and civil jurisdiction of the City of London. Saint Katharine by the Tower (image is in the Public Domain). Like London's other religious houses, it was dissolved at the time of the Reformation, but was almost immediately re-established as a Protestant institution under Henry VIII. 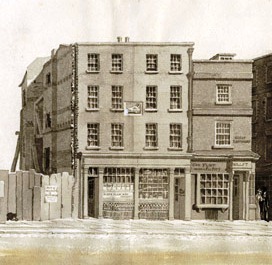 By this time, it had a brewery, and more than a thousand homes: a magnet for craftsmen who were not members of the City Guilds; for seamen and rivermen; but also for prostitutes (who were not allowed to operate within the City); and for those evading justice. The street-names tell their own stories: Dark Entry; Cat's Hole; Shovel Alley; Rookery; Pillory Lane. The Brothers' House of the hospital in 1781 (image is in the Public Domain). The rivermen who lived within this expanding, and increasingly insanitary and lawless, village to the east of the city used their boats to unload cargoes from ships that sailed directly into, and berthed in, the Pool of London (the stretch of river between the Tower and London Bridge). 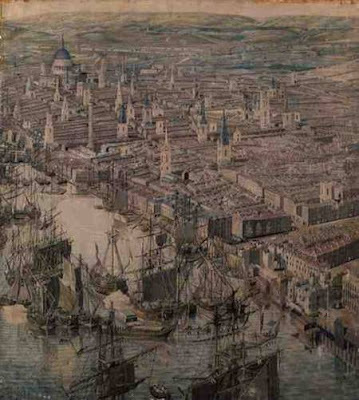 As Britain's mercantile economy grew, this expanse of water became more and more crowded with ships. 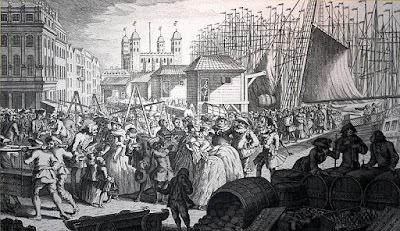 The London docks in 1757 (image is in the Public Domain). Detail from the Rhinebeek Panorama of 1806, Museum of London (image is in the Public Domain). 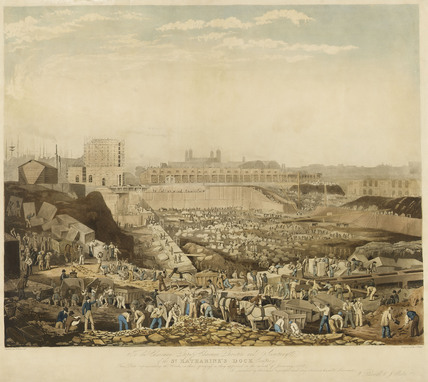 In 1825, an Act of Parliament provided for the creation of a new enclosed dock, to be built by the engineer, Thomas Telford. 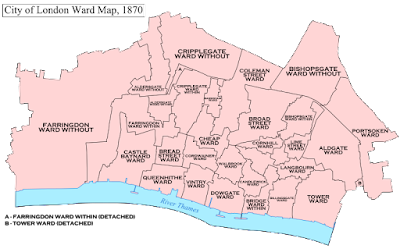 The Medieval hospital buildings were razed to the ground, and, with them, around 1250 homes, 11,300 people forced to move northwards, into the already overcrowded slums of Stepney and Whitechapel. 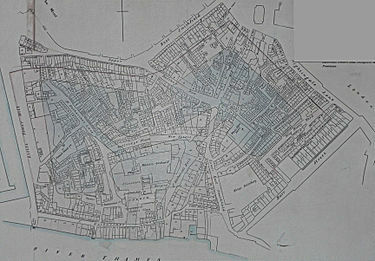 The plan for Saint Katharine's Docks (image is in the Public Domain). Saint Katharine's Docks under construction, by William Ranwell (image is in the Public Domain). 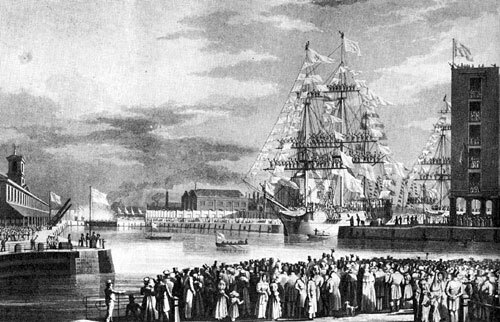 The opening of Saint Katharine's Docks in 1828, by W.J. Huggins (image is in the Public Domain). Saint Katharine's Docks were never a commercial success. Even as they were created, ships were being built, only a few miles downstream, that would be too large to enter them. Ivory, sugar, marble, rubber, carpets, spices, perfumes and indigo, were unloaded at Saint Katharine's for a period of decades only, before shifting to newer, and much larger, docks to the east. 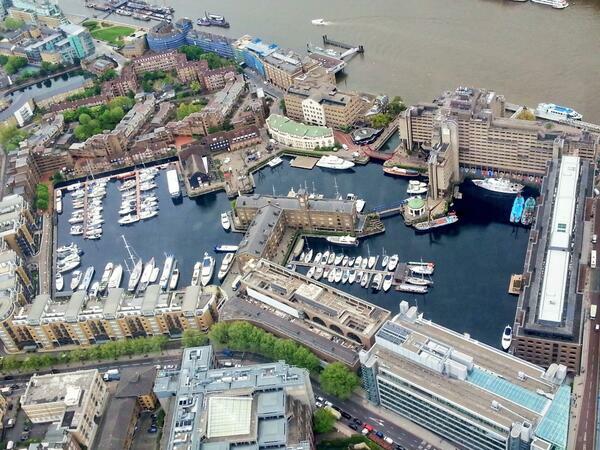 Saint Katharine's Docks: Photo: Metropolitan Police, NPAS. Saint Katharine's Docks. Photo: Matthias v.d. Elbe (licensed under CCA). The docks themselves survive (now a marina for pleasure-boats, surrounded by hotels, restaurants and luxury apartments), and with them the dedication to Saint Katherine, which, for most visitors today, is only a name. Post-Script: I recently learned that a series of misericords and other Fourteenth Century wooden sculptures from Saint Katherine have survived, and may be viewed by arrangement at the Royal Foundation of Saint Katharine in Limehouse. Further information may be found here. New Windows into Prehistoric Life: Thoughts on "Britain's Pompeii"
A programme recently broadcast by the BBC (and still available, to UK viewers, at least, on I-Player until the end of August), provides a timely update on one of the most exciting archaeological excavations to have taken place on these islands during my lifetime. 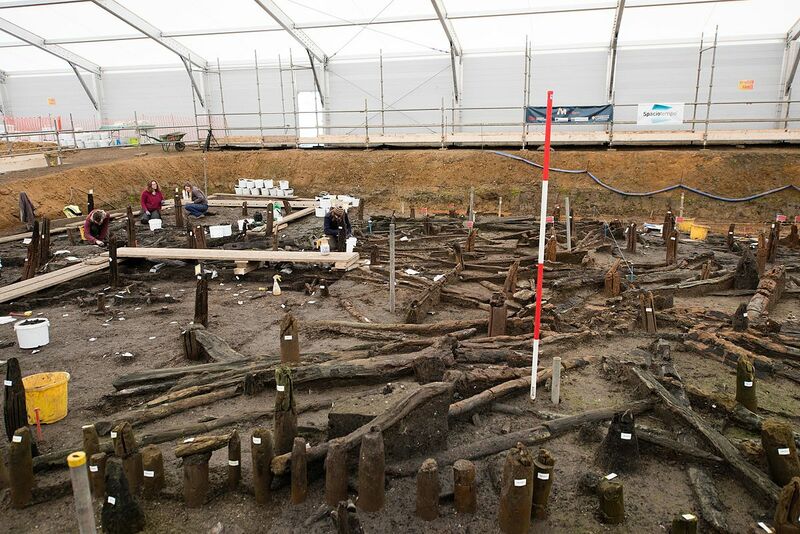 "Britain's Pompeii - A Village Lost in Time" charts the progress of excavations at Must Farm, Cambridgeshire, where a farmstead of the Late Bronze Age (c1000-800 BC) is being unearthed. 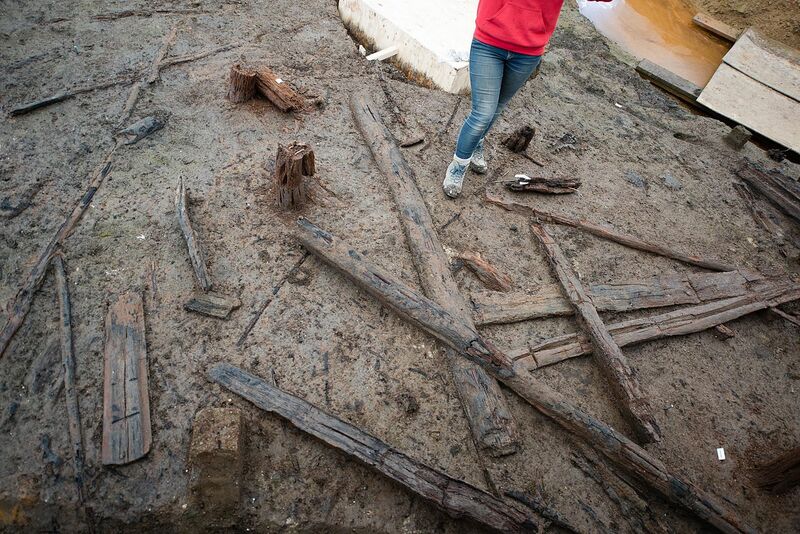 The four circular buildings, built on a platform jutting out over a river, burned down (or may have been torched by an enemy), and collapsed directly into the water, allowing for unprecedented preservation of wood, fabric, and other organic materials. Progress can be followed on the project website. Excavations at Must Farm. Photo: Dr Colleen Morgan (licensed under CCA).
" ... there are marshes that stretch for miles, and the people live on eels and duck, and strange plants that grow in the water, like reeds. It's easier to get around by boat than on foot in that place. That's where Nanti was born." 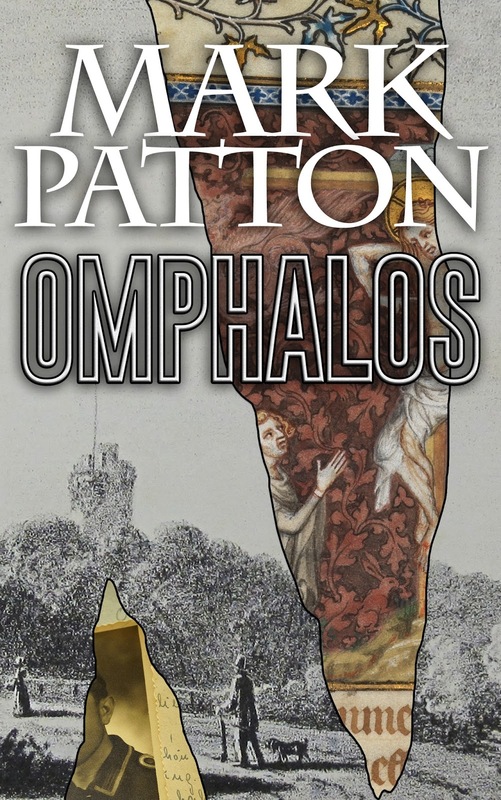 "Arthmael told of his homeland, of the village where he had been born. 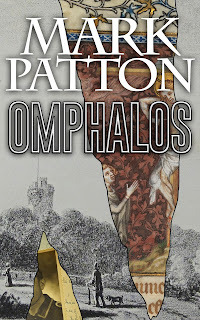 It was built on wooden poles, set on the edge of a great lake, with two high mountains rising behind it, their summits covered by snow, even in the summer." The place I had in mind was Lake Constance in Germany, where such settlements have indeed been found. Reconstruction of a Bronze Age "pile-dwelling" on the shores of Lake Constance, Germany. Photo: Traveler100 (licensed under GNU). 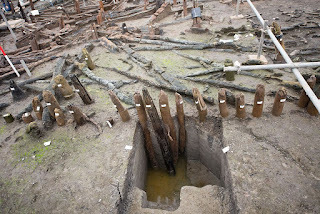 The settlement at Must Farm is the first true "pile-dwelling" found in Britain, built in much the same way as the settlements around Lake Constance, and elsewhere in Germany, Switzerland and eastern France, but with circular, rather than rectangular, houses. The people who built it lived at least 1400 years after the Amesbury Archer (they might, perhaps, have been the 56-times-great-grandchildren of Alaudina's sister), yet, remarkably, they seem to have been enmeshed in a network of international contacts and exchange that had endured since his time. Artefacts found at Must Farm suggest that this network extended not only into central, but also into southern Europe: they include glass beads which may have been made in northern Italy. It will be some considerable time before Must Farm reveals all of its secrets: excavation, which is still ongoing, is just the first stage in the research process. It will take much longer to analyse the food residues found in pottery bowls; the human and animal faeces discovered behind the houses; the carpentry techniques used to build the platform, and the houses themselves; the fragments of woven textiles that are emerging from the mud even as I write this post. Already, however, there are some hints, which are changing the way in which we understand this period in Britain's history. 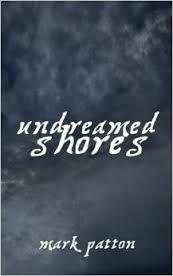 The characters in Undreamed Shores neither ride horses nor use wheeled transport: the people who lived at Must Farm almost certainly did both (a wooden wheel is one of the most significant discoveries announced to date). 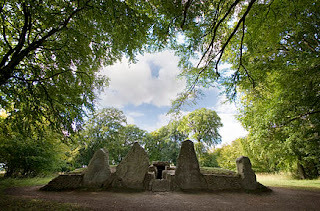 Arthmael and Nanti wear clothes of fur, leather, and woven wool: the people of Must Farm seem to have been using another important resource - linen, made from flax - the earliest evidence for this on the British Isles. This is a subject on which I will have more to say in a later post, not least because this is an industry with which I have a tangible, and much more recent, familial connection.